The call for views from the Scottish Parliament’s Standards, Procedures and Public Appointments (SPPA) Committee follows today’s publication of the Lobbying (Scotland) Bill. The Bill, introduced by the Scottish Government, seeks to increase public transparency of the interactions between lobbyists and elected representatives and Government Ministers. 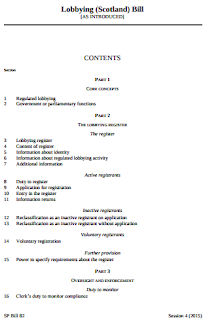 Its overarching objective is “to introduce a measured and proportionate register of lobbying activity”. The SPPA Committee wants to hear people’s views on whether the Bill is necessary and whether the establishment of a register is desirable. “The Scottish Government has already had the benefit of recommendations from our Committee’s inquiry into Lobbying published earlier this year. “According to the Bill, registration is only triggered when lobbying is being done in exchange for payment and does not capture lobbying carried out in the course of voluntary work - we want to hear if people agree with this approach. “For me, and for most constituents I speak to, the bottom line is we want our police service to be efficient, effective, and visible. “Feedback I get from the police suggests they now have access to more and better resources under Police Scotland. We know crime has fallen to its lowest level for 41 years. And in the North-east, we now have a greater level of scrutiny and engagement with community representatives from the police than we did under the previous arrangements. Banffshire & Buchan Coast MSP Stewart Stevenson has welcomed important discussions involving the SNP’s Westminster Transport Spokesperson, SNP Ministers and senior managers of Heathrow and Gatwick Airports. SNP Westminster Transport spokesperson Drew Hendry MP along with Scottish Government Cabinet Secretary for Infrastructure Keith Brown, and Scottish Minister for Transport and Islands Derek Mackay, held the meetings to stress the importance to Scotland’s economy of continued access to London’s airports. The issue of London airport slots serving Inverness and Aberdeen flights has been contentious in recent years for airports, local businesses and the wider public. “With MPs soon to consider the publication of the Airport Commission’s long-awaited report on expansion earlier this year the SNP are making it very clear that we want guarantees for the Scottish travelling public and business community that the - 'here today, gone tomorrow' situation over routes between our airports and London are guaranteed and improved . “We have seen several issues over the years over landing slots at Heathrow and Gatwick being traded at the expense of businesses and the travelling public here in the North-east. Local MSP Stewart Stevenson has described as ‘utterly scandalous’ the latest estimates being reported for Trident replacement, which have dramatically risen to more than £167 billion. The SNP MSP says that this ‘astronomical’ amount of money cannot be allowed to be spent on nuclear weapons that can never be used, especially when a fraction of the amount would cover the cost of welfare and tax credit changes which are hitting the poor and working families. “This is truly an unthinkable and indefensible sum of money to spend on the renewal of an unwanted and unusable nuclear weapons system while thousands of people in the North-east alone are set to lose thousands of pounds every year as a result of tax credit and welfare changes. “The UK Government is facing a United Nations probe over its cuts to support for disabled people and yet the Government’s own figures reveal that they are prepared to spend an astronomical £167 billion dumping four new Trident submarines on the Clyde. “Nuclear weapons are obscene and we should be leading the way in disarmament not re-igniting a nuclear arms race. “To allow the poor and working families in the North-east and across the UK to be pushed to the edges while throwing £167,000,000,000 at weapons of mass destruction is utterly scandalous. “Not only that, but at a time when Scotland’s conventional defence capabilities have shrunk dramatically with base closures and less than 10,000 personnel it is all the more alarming that there seems to be an endless amounts of money available for abhorrent nuclear weapons. “This almost incomprehensible amount of money could be used to invest more in conventional forces such as along the coast at Lossiemouth and Kinloss bases and cover the cost of tax credits and welfare and still have change. 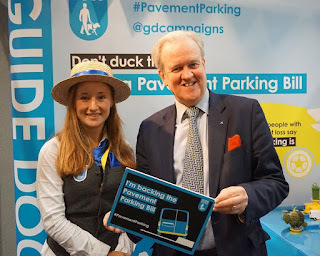 Stewart Stevenson, SNP MSP for Banffshire & Buchan Coast, took on the Hook-A-Truck challenge at the SNP Conference when charity Guide Dogs Scotland demonstrated the daily difficulties faced by people with sight loss. The charity used a twist on the funfair game ‘Hook-a-Duck’ to highlight the campaign, and Mr Stevenson became the guide when he navigated a rubber duck round a stream of obstacles. Mr Stevenson supports Guide Dogs Scotland’s campaign on pavement parking, including a proposed law to stop people from parking on pavements anywhere except where the council deems it unavoidable. “There are nearly two million people in the UK who are living with sight loss, and by 2050 there could be nearly four million - so it’s more important than ever that our streets are safe for people who are blind or partially sighted. Guide Dogs Scotland is currently running an online petition for the public to sign in support of the Footway Parking and Double Parking (Scotland) Bill, so local people can play their part in ending problem parking at www.guidedogsscotland.org.uk. “Parking on pavements is blighting our streets. It puts all pedestrians in danger, particularly those living with sight loss. “It is terrifying for someone who cannot see oncoming traffic to take the risk of stepping out into a road because someone has decided to park on the pavement. We hope this bill will see this dangerous practice outlawed once and for all, and call on all MSPs to back a change in the law." Stewart Stevenson, SNP MSP for Banffshire & Buchan Coast, has welcomed the first ever national cancer patient experience survey that has been launched by the Scottish Government and Macmillan Cancer Support. The survey has been sent out to all patients who had a confirmed cancer diagnosis between July 2013 and March 2014 and asks patients how they felt regarding the way they were told about their diagnosis, whether they understood the information provided about their treatment, and whether they had confidence and trust in the staff treating them. The results of the survey will be publically reported at national and health board level in summer 2016, and they will help to shape the future direction of cancer care in Scotland. “Macmillan is delighted that the Scottish Government has launched a cancer patient experience survey in Scotland. “It is the first time such a comprehensive survey of cancer patients’ experiences of care has been conducted in Scotland and Macmillan is delighted to be a partner in this hugely significant initiative. It is vitally important to measure survival rates and cancer waiting times targets, but it is equally important to find out what patients really think about the quality of the care they receive. Stewart Stevenson, SNP MSP for Banffshire & Buchan Coast, went on board Bertie the sensory bus at a recent Scottish Parliament event to experience the Play Talk Read project visiting his constituency this month. The Play Talk Read bus is hosting a range of free, accessible and therapeutic multi-sensory play sessions for children with additional needs and their families and will be in Buckie from now until November 11. Mr Stevenson met some of the children who were enjoying the books, toys and games on board, along with play dough and puffy paint, arts and crafts, a sandpit and a sensory pit to keep the children amused. The Play Talk Read Bus will be at Burnie Day Centre in Buckie on Wednesday 21st and 28th October and 4th and 11th November from 10am-11.30am; 1-2.30pm and 3-4.30pm. Session space is limited and booking is advisable. To book a space in one of the small group sessions contact Sarah Sibbert at sarah@workingonwheels.org or on 0131 664 2308. Remaining spaces on the day will be given out on a first come first served basis. Stewart Stevenson, SNP MSP for Banffshire & Buchan Coast, has lent his support to the UN gender equality ‘HeforShe’ campaign today (Tuesday). The campaign seeks to build solidarity amongst men for women’s equality as a basic human right that benefits all of society. It asks men across the world to sign the HeForShe Commitment, which pledges them to stand up against discrimination and violence against women. It has already been signed by almost 480,000 men across the world including the Presidents of the USA, Japan and Malawi. Mr Stevenson has called on men across Banffshire and Buchan Coast to join him in signing and to push the number of commitments to over 500,000. He also called for Prime Minister David Cameron to join other global leaders including President Obama in becoming an Impact Champion for the campaign. “Women make up more than half of the world’s population – yet women and girls across the world still face stark inequalities, discrimination and violence simply because of their gender. We all, men and women, must stand in solidarity against this injustice. “The SNP is unequivocal on this – gender equality is a human rights issue and the realisation of true equality will benefit all of society. “I would encourage all men in across Banffshire and Buchan Coast to log on to heforshe.org and sign the commitment. The campaign is tantalizingly close to reaching half a million commitments – with a concerted effort Scotland can help them reach this mark. Stewart Stevenson, SNP MSP for Banffshire & Buchan Coast, has met with senior staff at the Scottish Ambulance Service to discuss concerns about ambulance cover in the North East. Earlier this month, Mr Stevenson met with Chief Executive Pauline Howie, and Milne Weir, Divisional General Manager of the Scottish Ambulance Service, at Holyrood to discuss their progress and plans for the future. Mr Stevenson and Banff and Buchan MP Eilidh Whiteford have held a series of meetings over recent months with senior regional management at the SAS and front-line emergency personnel to examine concerns that there are areas of the North East not adequately covered by the ambulance service. As a result, initiatives such as a recruitment drive to enlist and train more specialist ambulance personnel and increased co-operation with partnership organisations such as Scottish Fire and Rescue have been progressed. “As a result of a number of concerns from constituents I felt that it was important to meet with senior personnel from the Scottish Ambulance Service for an update on their progress. “I was delighted to hear that their national recruitment drive has been very successful and that they are working hard to fill vacancies within the service in the North East. They are also providing a comprehensive training programme for those joining up. “They assured me that they have been doing extensive engagement within the community over the past 18 months, and that the ambulance service are very much part of a community team approach across the area, working with local partners – which will benefit many people in the long term as well as the short term. At the meeting, SAS Chief Executive Pauline Howie said they had identified that seven in 10 of every emergency 999 call could be treated by professionals out with a hospital context, and that the service was working on a more effective joined up care within the community. “I am very pleased that substantive action is being taken to address the concerns of local communities in the North East, and to restore and improve on the levels of emergency cover across the area. Banffshire & Buchan Coast MSP Stewart Stevenson has welcomed the announcement that a moratorium will be placed on offshore Underground Coal Gasification (UCG) in Scotland. The announcement by the Scottish Government also included a timetable for an “extensive” research and consultation process into the impacts of onshore unconventional oil and gas exploration. SNP MSP Mr Stevenson has received hundreds of emails from constituents concerned about the potential for environmental damage by fracking and UCG. “Many of my constituents have serious reservations and concerns about the processes involved in fracking and Underground Coal Gasification. “These are relatively new technologies and it is absolutely right that they should be subject to rigorous analysis and evidence gathering before they can be deemed safe or otherwise. Stewart Stevenson, SNP MSP for Banffshire & Buchan Coast, questioned Education Secretary Angela Constance today (Wednesday) on what the Scottish Government is doing to address teacher shortage in the North East and how local recruitment is being supported. Ms Constance agreed that young people and those who are newly trained should be encouraged to stay within their communities in the North East. “The Scottish Government is committed to working with local authorities and universities to develop routes into teaching that enable people to remain within their local area. Ms Constance attended the Teacher Summit last week in Aberdeen to discuss the problem of teacher recruitment. Ms Constance added that this innovation had been widely welcomed by local authorities and that she was looking into extending this to the secondary sector.